Best wishes and eagerly awaiting your next update. H�kan always enjoy catching up in your thread. I really like the look of the old mining loco. Back in the early 90's I worked underground in a gold mine and first job I had was running a tram line and the engines on each end of the train were battery operated, you bring back some nice memories. Thank you Matt, that was some great links! The loco pulling the Raymond special looks similar to my model with those slanted cylinders. I can't discern what the wheel arrangement is but it could be a 4-4-0. It looks quite strange with that large cowcatcher in the front. Just the look I'm after. I have been hiding in the weeds over here and read that you're "entertaining" a flu virus. I think that I can speak for myself as well as many others when I say, "I hope you're feeling better soon". Thanks Greg, I'm feeling much better. It is this time a year in Sweden when people here are the most sick. a sailmaker's shop. Congradulations!!! and a job well done to you. Thank you very much Bob! And thank you for your kind words on the layout. I must say that I was deeply honored to have a building on Greg's fantastic Magoun Pier named after me. * what professional drywall installers call tapping drywall over here. And what I spent the morning doing. I hope it works out great with the mudding! Ugh! I think I'd rather spend a day at the dentist! muddin' is the fun part. its the sanding that kills ya. hakan (sorry, i don't know how to make the thingie above the a), you do fantastic work. you're really giving troels a run for his money. like the coast line rr, i keep going to this thread for inspiration, learning, and just because i enjoy your pics so much. great layout in all regards. Thanks H�kan, My muddin' is working out but Kevin is right, the sanding does kill you. Wife and I both learned how to do wallboard taping, but not how to do it well! I'll still consider a day at the dentist. i hired a buddy to drywall and tape my garage (a couple of houses ago) and he showed up with a tool drywallers call the "bazooka". he had my garage fully mudded in less than an hour. sanded it, and did another coat. sanded it, and was out the door within 4 hours. had i done it myself i'd probably still be working on it. Thanks Kevin for the kind words! 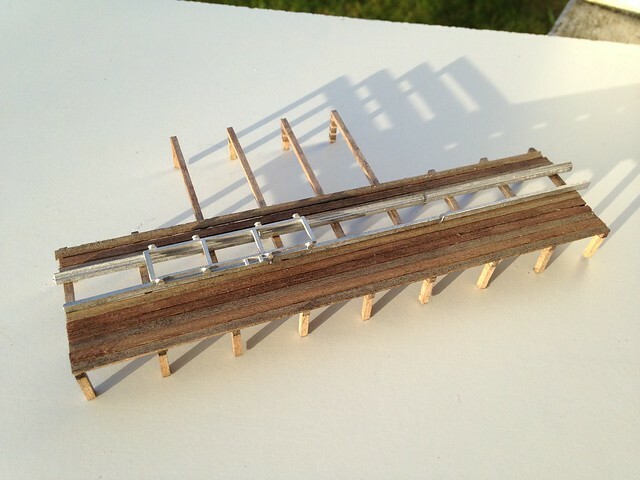 I have started on a new sawmill kit. Its a Keystone Danby kit that I will make some changes to so it fits a location on the layout at a pond. I'll make a log haul that transports the logs up from the pond. I have started on the foundation but stopped as I need to assemble and paint all the castings. What I'm wondering is how the carriage and machinery was painted? I have googled on sawmill pictures but everything I have found is old, worn and rusty. My guess is that the machinery, carriage etc came painted from the manufacturer. I want the equipment moderately worn as the mill just have a couple of years on it and the equipment was bought new. I also can't find any good information on the log haul. Are there any manufacturers out there that makes log haul parts in HO?